Coming Home to New Orleans documents grassroots rebuilding efforts in New Orleans neighborhoods after hurricane Katrina, and draws lessons on their contribution to the post-disaster recovery of cities. 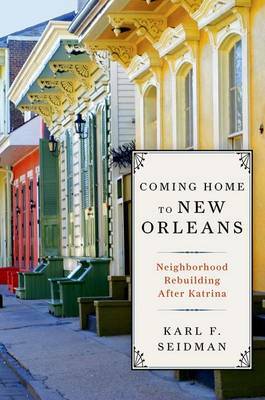 The book begins with two chapters that address Katrina's impact and the planning and public sector recovery policies that set the context for neighborhood recovery. Rebuilding narratives for six New Orleans neighborhoods are then presented and analyzed. In the heavily flooded Broadmoor and Village de L'Est neighborhoods, residents coalesced around communitywide initiatives, one through a neighborhood association and the second under church leadership, to help homeowners return and restore housing, get key public facilities and businesses rebuilt and create new community-based organizations and civic capacity. A comparison of four adjacent neighborhoods in the center of the city show how differing socioeconomic conditions, geography, government policies and neighborhood capacity created varied recovery trajectories. The concluding chapter argues that grassroots and neighborhood scale initiatives can make important contributions to city recovery in four areas: repopulation, restoring "complete neighborhoods " with key services and amenities, rebuilding parts of the small business economy and enhancing recovery capacity. It also calls for more balanced investments and policies to rebuild rental and owner-occupied housing and more deliberate collaboration with community-based organizations to undertake and implement recovery plans, and proposes changes to federal disaster recovery policies and programs to leverage the contribution of grassroots rebuilding and more support for city recovery.